Pike-perch fillets are often compared by the culinary experts to the local walleye. Biology: originates from the pristine European waters. It resembles pike with its elongated body and head, and the perch with its spiny dorsal fin. Pike-perch, however, is not, as is commonly beleved, a pike and perch hybrid. 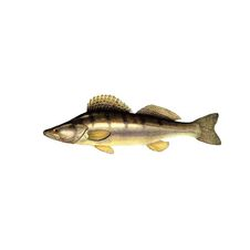 Pike-perch inhabits deep, calm waters of lakes, reservoirs, canals and rivers. Feeds mainly on fishes. Average size is 20-26 inches (50.8 - 66 cm).